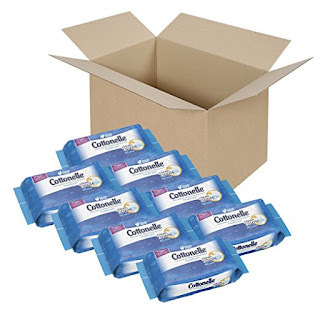 Prime Members...Right now Amazon has this 8-PACK of Cottonelle FreshCare Flushable Cleansing Cloths (includes 336 wipes in total) for just $9.44 shipped when you clip the $1 coupon and choose Subscribe and Save! 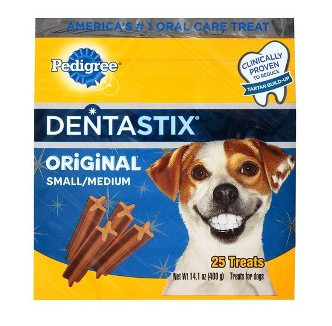 That makes each 42-count pack just $1.18 shipped! I'm loving this Bow Back Flag Tank for the summer $21.99 (Retail $39)! Add a little flair to your festive Americana get up this year! The darling little bow is subtle enough, yet makes a huge statement in our country's colors! $3.99 for the first item and $2.99 for each additional item. US only. Seller usually ships within 4 business days. Ships no later than Tue, May 9. Running now through May 1st, VeraBradley.com is offering an additional 50% off thirty different styles of bags – no promo code needed. Even sweeter, shipping is FREE on all orders. 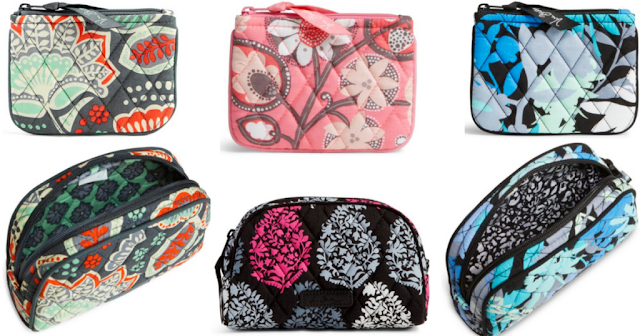 As an idea, you can score this Vera Bradley Coin Purse for only $7 shipped (Retail $14)! As another idea, you can grab this Small Zip Cosmetic bag for only $12 shipped (Retail $24). This weekend only check out the Big, Big $5 Blowout over at DiscountMags! Choose from more than 100 Favorite Magazine Subscriptions for ONLY $5 per year each! Head over and check out the selection of fan favorites and get your subscription today! 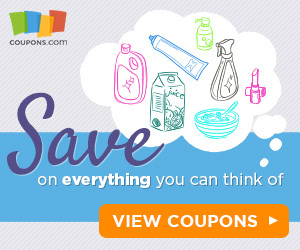 There are quite a few new printable coupons available today from RedPlum! Here's a roundup of the ones you can print now, but hurry, the popular coupons reach print limits quickly. SAVE $2.00 off any ONE (1) STAINMASTER® Carpet Stain Remover, Pet Stain Remover or High Traffic Cleaner. Right now you can get 50% off AND free shipping on Mother’s Day aprons and kitchen essentials right now at Flirty Aprons when you use the code MOM50 at checkout through May 8th. 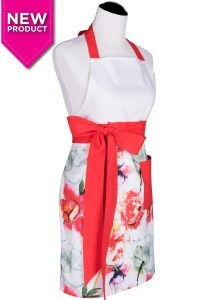 These aprons are great quality and come in tons of different patterns and styles. Mother’s Day orders should be placed by May 8 to receive products in time for the holiday. If you are expecting make sure you join Enfamil Family Beginnings® and get up to $325 in FREE gifts including coupons, formula samples, Belly Badges™, and more! I was a member when my children were little and this was one of my favorites. I ♥ the coupons! 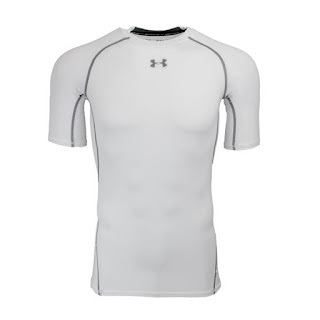 Right now you can snag this Under Armour Men's HeatGear Compression T-Shirt for only $14.99 (Reg.$27.99) when you use code PZY1499. Shipping is FREE on this deal! Sizes S-XXXL available. Multiple color options. HeatGear fabric, with all the benefits of UA. Compression, comfortable enough to be worn all day. Stretch-mesh underarm panels deliver strategic ventilation. UPF 30+ protects your skin from the sun's harmful rays. 4-way stretch fabrication allows greater mobility in any direction. Moisture Transport System wicks sweat & dries fast. Anti-odor technology prevents the growth of odor causing microbes. Mesh panel on back neck with ARMOUR wordmark. Right now you can get your FREE L.E.D. Dog Collar, just pay $7.95 for shipping and handling when you enter promo code 15OFF. This is perfect for increasing visibility of your dog! Collars are made of durable nylon. Right now Julep is offering this 12 pc Nail Polish Gift with New Julep Beauty Subscription. Experiment fearlessly with Julep's monthly beauty box. Get on trend, full-size beauty or skincare products each month — curated just for you! Get a free polish set when you join Julep Beauty Box. Includes twelve full-size nail polish. A $168 value. This weekend Discount Mags is offering No Tax & Free Shipping + $5 Magazine Blowout Sale! You'll find HOT subscriptions like Family Fun, Family Circle, Rachael Ray Every Day, Better Home & Garden + MORE! Really considering grabbing a few of these for camping and sleepovers. Today ONLY - These ALPS Sleeping Pads (Your Choice) $28.99 - $59.99! -Dimensions: Regular: 20" x 72" x 1.5" Long: 25" x 77" x 2" XL: 30" x 77" x 3"
-Weight: Regular: 2 lbs. 10 oz. Long: 4 lbs. 1 oz. XL: 6 lbs. 7 oz. -Weight: Regular: 2 lbs. 4 oz. Long: 3 lbs. 14 oz. XL: 6 lbs. 5 oz. Don't miss this sweet deal! Right now you can get this Silhouette Cameo 3 Craft Bundle $199.99 (Retail $344.99)! -Blade and other storage compartments keep all the extra blades and tools in one easy to access storage compartment. Today ONLY - Honey-Can-Do Toy Organizer (Your Choice) for $44.99 (Retail $136.99)! Monitor what's going on around your home with Up to 40% Off Security Cameras! I really want this *HIGHLY RATED* Oco Pro Bullet Outdoor/Indoor Camera JUST $119 (Retail $169)! Browse around for your needs! Today ONLY - Kindle NonFiction Best Sellers $1.49 &amp; Up! Stock Up on this great gift! Right now you can snag a ALEX Toys Craft Loop 'N Loom ONLY $9.59 (Retail $24)! Right now this Intex Dura-Beam Series Elevated Deluxe Airbed with Built-In Electric Pump, Bed Height 18", Queen is $43.99 (Retail $57.50)! -60" x 80" x 18"
Here is another great deal for dad! 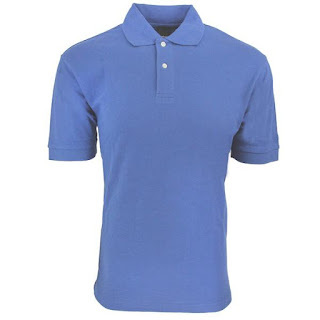 Right now you can get this Reebok Men's Cotton Polo Shirt for only $12 (Reg. $35) when you use code PZY12. Sizes S-5XL available. 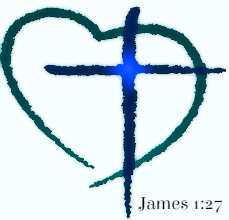 Several color choices available. Look good in this lightweight, clean-cut, 2-button, 100% Cotton Reebok Polo. Nordstrom is offering Up to 50% Off a selection of beauty items and accessories, plus Free Shipping. Plus get a FREE Gift with $35 Estee Lauder Purchase ($155 Value) - use code GIFT1 or GIFT2 at checkout. Browse around Cleansers, Lip Gloss, Cosmetic Bags and Nail Polish. 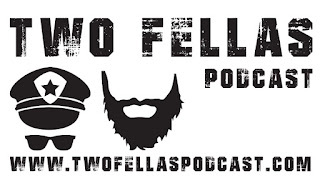 $3.00 EXTRABUCKS WHEN YOU SPEND $12.00, LIMIT 1. Starting April 30th, Target will be offering $5 off your pet care purchase of $25 or more or $10 off your pet care purchase of $40 or more with the coupons found in the ad, on the Cartwheel app, or by texting PET5 (for the $5 coupon) OR PET10 (for the $10 coupon) to 827438, starting 4/30. Here’s one idea to get you thinking! Final Cost = $9.23 total – just $3.08 each! 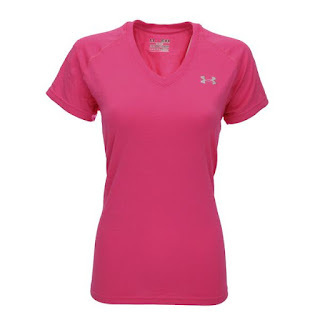 I am loving this Under Armour Women's UA Tech V-Neck T-Shirt for only $14.98 (Reg. $27.99) when you use code PZY1498. Shipping is FREE. Sizes XS-XL. Several color options available. Updated UA Tech fabric has a softer, more natural feel for incredible all-day comfort. Signature Moisture Transport System wicks sweat to keep you dry and light. Anti-odor technology keeps your gear fresher, longer. Extended body length delivers the perfect amount of coverage. Raglan sleeves unlock mobility for serious range of motion. Deep V-neck collar & slimmer fit deliver a sleeker, more feminine silhouette. Now through May 7th, Macy’s is hosting their Friends and Family Sale and offering 10% off any Beauty Purchase when you use the code FRIEND at checkout. Plus, all beauty purchases ship for FREE! If you like Clinique products, get a FREE 7-Piece Gift when you make a $28 Clinique purchase (a $70 value!). And, if you make a $55 Clinique purchase, you’ll also receive a FREE Repair or Contour Duo and a FREE Happy Spray and Chubby Mini in Super Strawberry! What a great gift idea! 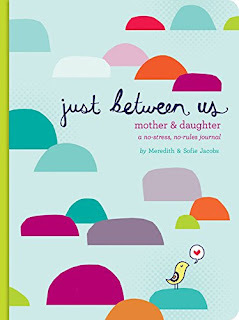 Right now this Just Between Us: Mother & Daughter: A No-Stress, No-Rules Journal is only $12.31. What your mom was like at your age? Or what your daughter’s earliest memory is? If you need Graduation Invitations here is a hot deal you don't want to miss! Right now save an extra 30% off all party invitations + FREE Shipping at Tiny Prints when you use code NVITEAFF30FS. Offer expires 05/02/2017 (11:59 P.M. PT). 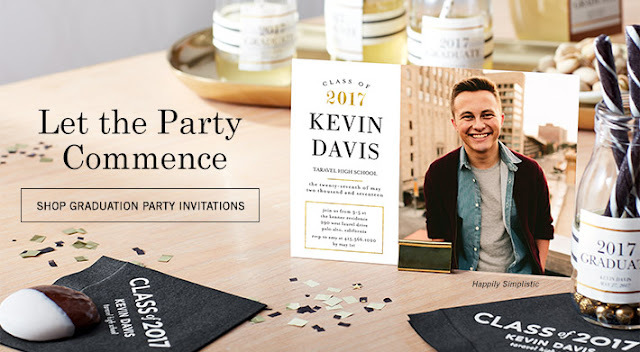 Save 30% off party invitation orders and enjoy free Standard or USPS Shipping using the code INVITEAFF30FS at checkout. Shipping offer applies to non-sample orders shipped to a location within the 48 contiguous United States. Shipping offer applies to Standard and USPS Shipping rates only. Offer applies exclusively to baby shower invitations, bachelorette party invitations, birthday invitations, bridal shower invitations, engagement party invitations, graduation invitations, rehearsal dinner invitations, or party invitations and is not applicable to previously placed orders, taxes, rush processing charges, gift certificates, personalized postage stamps, or any other product available on TinyPrints.com. This promotion code cannot be combined with other offers. Offer is only valid on Tinyprints.com and is not applicable on third party or partner websites. To prevent fraud or abuse, we reserve the right to discontinue or modify this offer or cancel any order.